These fiber collimation packages are pre-aligned to collimate light from an SMA connectorized fiber with diffraction-limited performance. Because these fiber collimators have no movable parts, they are compact and not susceptible to misalignment. Due to chromatic aberration, the effective focal length (EFL) of the aspheric lens is wavelength-dependent. As a result these collimators will only perform optimally at the design wavelength. The aspheric lens is factory-aligned so that it is one wavelength-adjusted focal length away from the fiber tip when inserted into the collimator. In addition, the aspheric lens has an AR coating that minimizes surface reflections. These packages can also be used to couple a free-space laser beam into an optical fiber. To obtain a high coupling efficiency, the NA of the patch cable needs to be greater than or equal to the NA of the collimator, and the diameter of the focused beam needs to be smaller than the MFD/core of the fiber. Please refer to the Specs tab for suggested mounting adapters. a For optimal collimation, these packages should be used at the alignment wavelength. For some applications, they may also be used within the AR coating range. Contact Tech Support for custom-alignment packages. 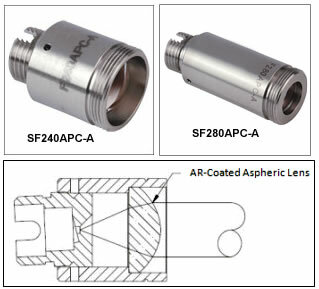 The SF240APC, SF260APC, SF280APC, and SF671APC Series of fiber collimation packages are pre-aligned to collimate a laser beam propagating from the tip of an FC/APC (2.1 mm wide key compatible) connectorized fiber with diffraction-limited performance at the design wavelength. The receptacle of the housing is angled, and the beam is aligned with the mechanical axis of the package, as shown in the schematic above. Because the F200-Series fiber collimators have no movable parts, they are compact and not susceptible to misalignment. Due to chromatic aberration, the effective focal length (EFL) of the aspheric lens is wavelength-dependent. As a result, these collimators will only perform optimally at the design wavelength. The aspheric lens is factory-aligned so that it is one focal length away from the fiber tip when inserted into the collimator. This distance is equal to the focal length of the aspheric lens at the design wavelength. In addition, the aspheric lens has an AR coating that minimizes surface reflections. These packages can be used to couple a free-space laser beam into an optical fiber. To obtain a high coupling efficiency, the NA of the patch cable needs to be greater than or equal to the NA of the collimator, and the diameter of the focused beam needs to be smaller than the MFD of the fiber. Please refer to the Technical Specs for suggested mounting adapters. The FC/APC conectorized collimation packages are ideal for systems that are sensitive to back reflections. APC-Style connectors utilize a ferrule that has an 8° end face, and in conjunction with an ultra PC polish, provide a return loss Greater than 60 dB. We also offer a line of adjustable collimation packages called FiberPorts that are well suited for a wide range of wavelengths. These are ideal solutions for adjustable, compact fiber couplers. For other collimation and coupling options, please contact us. a For optimal collimation, these packages should be used at the alignment wavelength. For some applications, they may also be used within the AR coating range. Contact Tech Support. 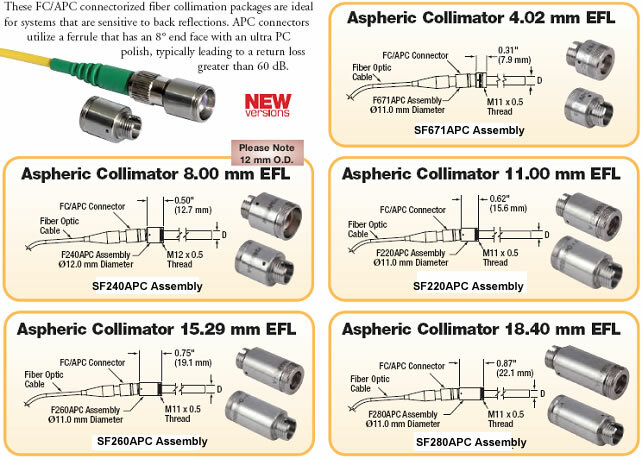 The SF220FC, SF230FC, SF240FC, SF260FC, SF280FC, and SF671FC Series of fiber collimation packages are pre-aligned to collimate a laser beam propagating from the tip of an FC/PC (2.1 mm wide key compatible) connectorized fiber with diffraction-limited performance. Because the F200-Series fiber collimators have no movable parts, they are compact and not susceptible to misalignment. Due to chromatic aberration, the effective focal length (EFL) of the aspheric lens is wavelength-dependent. As a result, these collimators will only perform optimally at the design wavelength. The aspheric lens is factory-aligned so that it is one focal length away from the fiber tip when inserted into the collimator. This distance is equal to the focal length of the aspheric lens at the design wavelength. In addition, the aspheric lens has an AR coating that minimizes surface reflections. These packages can be used to couple a free-space laser beam into an optical fiber. To obtain a high coupling efficiency, the NA of the patch cable needs to be greater than or equal to the NA of the collimator, and the diameter of the focused beam needs to be smaller than the MFD of the fiber. Please refer to the Specs tab for suggested mounting adapters. We also offer a line of adjustable collimation packages called Fiber Ports that are well suited for a wide range of wavelengths. These are ideal solutions for adjustable, compact fiber couplers. For other collimation and coupling options, please contact our technical support group. a For optimal collimation these packages should be used at the alignment wavelength. For some applications they may also be used within the AR coating range. Contact us for custom alignment packages. The divergence angle listed in the specifications table above is the measured beam divergence angle when using the fiber collimator at its design wavelength with the specific fiber denoted in the specifications table footnote. This divergence angle is easy to approximate theoretically using the formula shown below as long as the light emerging from the fiber has a Gaussian intensity profile. This works well for single mode fibers, but will underestimate the divergence angle for multimode fibers where the light emerging from the fiber has a non-Gaussian intensity profile. θ ≈ (0.0035 mm / 11.0 mm) x (180 / 3.1416) ≈ 0.018°. When the beam divergence angle was measured for the SF220SMA-A collimator a 460HP fiber was used with 543 nm light. The result was a divergence angle of 0.018°. We offer several different families of collimation packages, which are summarized in the table below. 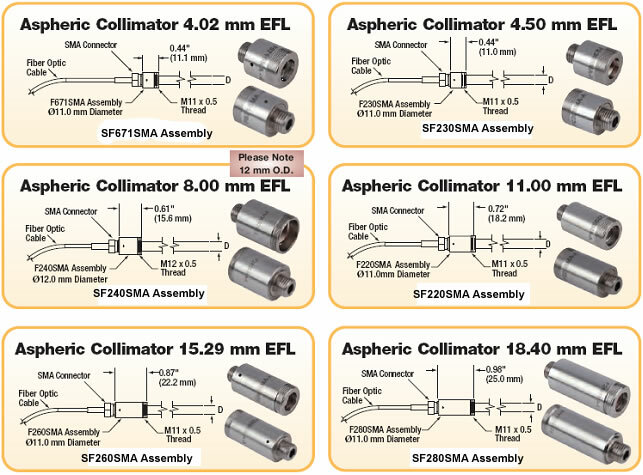 Our selection of fixed fiber collimators include packages with aspheric lenses, which mate with SMA and FC connector. For larger beams, our air-spaced doublet collimators are ideal. These collimators are designed to couple a free-space laser beam into an optical fiber. Each collimation package is factory aligned to provide diffraction-limited performance at one of six wavelengths: 405, 543, 633, 1064, 1310, or 1550 nm. Although it is possible to use the collimator at detuned wavelengths, they will only perform optimally at the design wavelength due to chromatic aberration, which causes the effective focal length of the spheric lens to have a wavelength dependence. 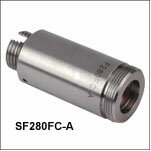 For large beam diameters (Ø6.6 - Ø8.5 mm), we offer FC/PC, SMA, and FC/APC air-spaced doublet collimators. These collimation packages are pre-aligned at the factory to collimate a laser beam propagating from the tip of an FC or SMA conectorized fiber and provide diffraction-limited performance at the design wavelength. These snap-on collimators are designed to connect onto the end of an FC/PC or FC/APC connector and contain an AR-coated aspheric lens. The distance between the aspheric lens and the tip of the FC-terminated fiber can be adjusted to compensate for focal length changes or to recollimate the beam at the wavelength and distance of interest. Our pigtailed collimators come with one meter of either single mode or multimode fiber, have the fiber and AR-coated aspheric lens rigidly potted inside the stainless steel housing, and are collimated at one of five wavelengths: 532, 1030, 1064, 1310, or 1550 nm. Although it is possible to use the collimator at any wavelength within the coating range, the coupling loss will increase as the wavelength is detuned from the design wavelength. We offer four gradient index (GRIN) fiber collimators that are aligned for either 1310 nm or 1550 nm and have either FC connectorized or unterminated fibers. Our GRIN collimators feature a Ø1.8 mm clear aperture, are AR-coated to ensure low back reflection into the fiber, and are coupled to standard Corning SMF-28 single mode fibers. 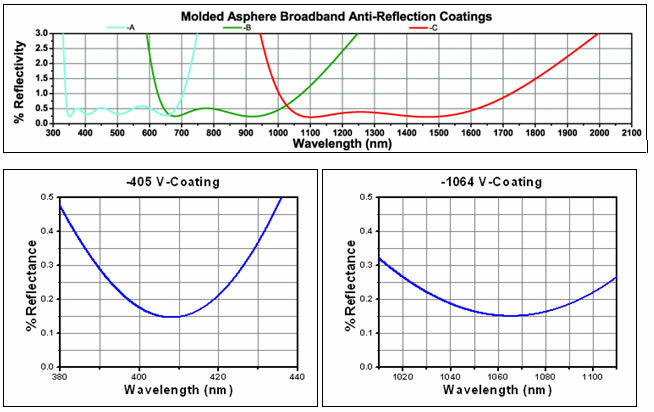 These graded-index (GRIN) lenses are AR coated for applications at 1300 or 1560 nm that require light to propagate through one fiber, then through a free-space optical system, and finally back into another fiber. They are also useful for coupling light from laser diodes into fibers, coupling the output of a fiber into a detector, or collimating laser light. Our pigtailed ferrules have broadband AR coatings centered at either 1310 nm or 1550 nm and are available with either a 0o or 8o angled face. These pigtailed ferrules include 1.5 meters of SMF-28e fiber. These new compact, ultra-stable FiberPort micropositioners provide an easy-to-use, stable platform for coupling light into and out of FC/PC, FC/APC, or SMA terminated optical fibers. It can be used with single mode, multimode, or PM fibers and can be mounted onto a post, stage, platform, or laser. The built-in aspheric lens is available with three different AR coatings and has five degrees of alignment freedom (3 translational and 2 rotational). The compact size and long-term alignment stability make the FiberPort an ideal solution for fiber coupling, collimation, or incorporation into OEM systems.